Before this session I took advice I had been given previously and asked those who I wanted to come through to please try to come through strong. I actually invited ALL my departed family members to show up and gave an open invitation to whoever would like to come. It's probably better to be a little more specific about who you invite . . . . One of the first things Brandie said was that there were quite a few who had shown up for this reading, which as it turned included a couple of souls I had no idea who they could be. Brandie also said at one point during the reading that it was like my family was lined up to come through. So I guess I should watch out what I ask for! My great-grandfather [William McKendree - (Mack)] on my mother's side was next and he definitely is one of the last souls I would expect to hear from. Brandie sensed a grandfather or uncle who was a heavy alcoholic. She felt he was a generation up from my parents. Mack wanted to tell Brandie how he felt because he had a lot of burdens. (Brandie stated that she almost felt like a psychologist, that he just wanted to sit down and tell her how he feels.) He told her he felt like he couldn't give enough or provide enough to his family. She said he felt immense pressure to make things happen and he did not want to give Brandie any details. There was a period of time that he was drinking where he was really snappy and harsh with his words, not a lovey-dovey type of guy. Brandie felt there was a physical side to him and he let Brandie know that yes he was abusive. Mack told her he was not proud of it, he is owning it and Brandie felt that is why he was coming through. He could be abusive with the children and particularly with his spouse. Mack claimed alcoholism was handed down from his father and Brandie thought that either my grandfather or father broke the chain of alcoholism. Brandie saw that Mack had two brothers or was one of two and that one brother was particularly successful. It was like Mack was comparing himself to this brother who was successful and had it together and he felt he couldn't live up to his brother. [According to family lore, Mack was a mean drunk. One cousin wrote that three of my aunts "historicize the old reprobate was a drinker. They report that when Granpa's kids heard his buggy race into the yard late at night with Granpa layin' on the leather and whipping the horses they knew the old fart was tanked up and mean drunk . . . his children all dived for cover and hid out till the alcohol wore off." He was also a Methodist minister which may be why I never thought of him as an alcoholic. Actually, I just never thought of him that much! My grandmother and two of her sisters I know of hated him because of how he treated their mother. Mack suffered from a rare condition called polyorchidism - basically he had three testicles. Too much testosterone and alcohol can make one nasty man. Brandie felt that Kim could be sharp with her words, especially toward her mother. She would get angry a lot and would blame her mother for a lot of things. She feels the need to say that there was a lot of internal conflict, a lot of little things set her off. Also, she really worried about what other people thought about her even if she didn't give that impression. She told Brandie that "I blamed everybody else and I shouldn't have." There was something that triggered all of this attitude, a particular incident and she needs them to acknowledge this. Brandie wondered if it was abuse from in or outside the family because something traumatic triggered this and Kim needed this to be recognized. But Brandie also said that Kim might not have told anyone or if she did tell she was just told it would be o.k. Brandie asked me a couple of times if her parents were divorced [no]. Brandie told me that hearing names was something new to her and so far usually gets just a few letters. I thought she was very close with Julie and hearing the strong Ju name. Mediums I see on television usually just give one letter. The only exceptions I have seen are Kim Russo and John Edwards. On a more recent trip to New York City with my husband it seemed there were signs everywhere for psychic services. I was so tempted to call for the five dollar special. (I have a feeling it would have been a cold reading.) 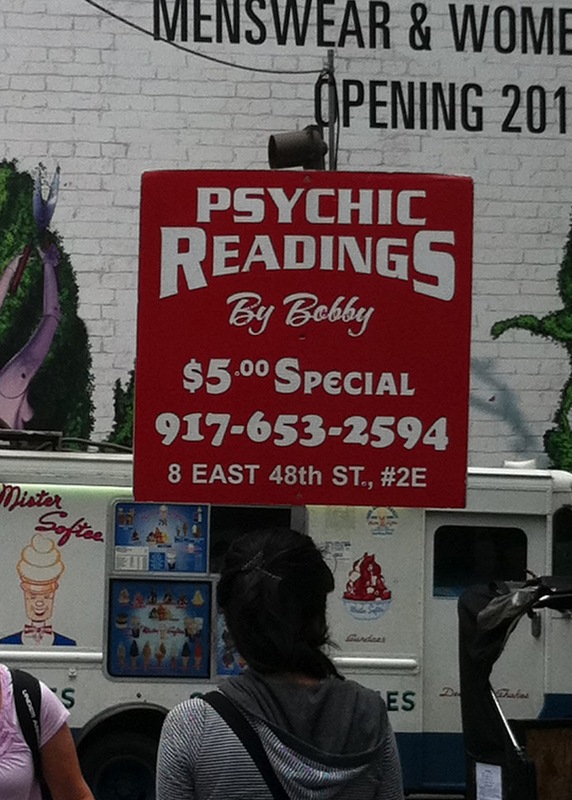 Very curious about where Bobby's office could have been with charging such low rates. I saw this sign as we were walking down 7th Ave toward Times Square. Sort of hard to tell from the photo, but the girl is actually holding the sign. I had to wonder if she worked an eight hour day walking around Manhattan with that sign. 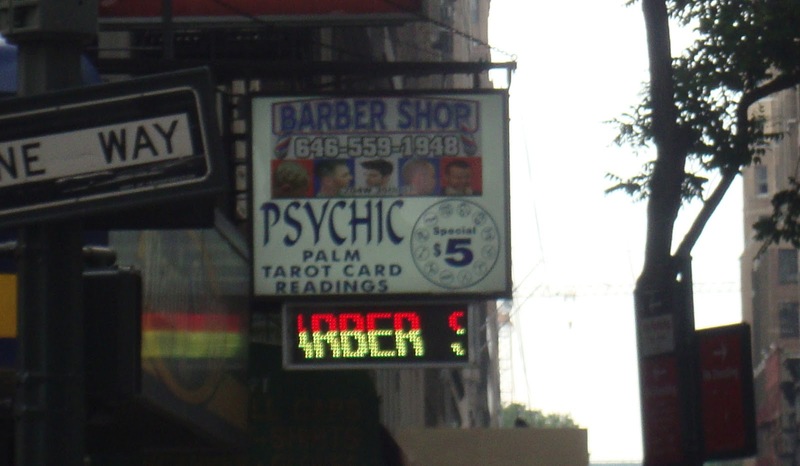 On the way back from Times Square I saw two more advertisements for psychic services.